These calzones are quick to prepare, and can be made in advance and frozen for lunches or weeknight meals. You can use a frozen pizza dough, or make your own (see Lauren's whole wheat pizza dough recipe here). Preheat oven to 350 degrees F. Spray a small baking pan with canola. Chop broccoli into bite sized pieces and place on the pan. Season with black pepper. Put the broccoli in the oven and roast for 20 minutes, until tender. While broccoli is cooking, dice ham into 1cm cubes. Remove broccoli and set aside to cool slightly. Increase oven temperature to 375 degrees F. Divide pizza dough into four equal pieces. Set three aside. Spray a large baking sheet with canola. Place one dough on the sheet and roll it out until it is thin, in a rectangular shape. 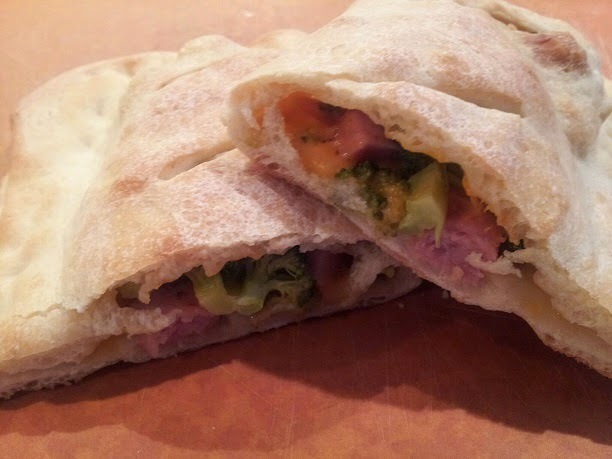 On one side of the dough, add 1/4 of the ham pieces, broccoli, and cheddar in a line. Fold the dough over and press down the sides with your thumb to seal it shut. Use a paring knife to make four diagonal slices across the top of the calzone to allow air to escape. Repeat steps with remaining dough pieces. Bake for 14-15 minutes. Allow to cool for 3-4 minutes before serving.